The fall mushroom season here in Washington looked promising back in July and early August. We had a wet spring, there was good snowpack in the mountains, and another "marine layer" summer seemed likely. All that changed by mid-August. The weather turned hot and dry. Chanterelle pinheads—those baby mushrooms barely visible in the moss—either dried up or went dormant. Lobsters called it quits. And porcini never got out of the gate. We finally got a significant rain the other day, but it may be too little too late. We'll see. In the meantime, there are chanterelles if you hunt in the likeliest microclimates. 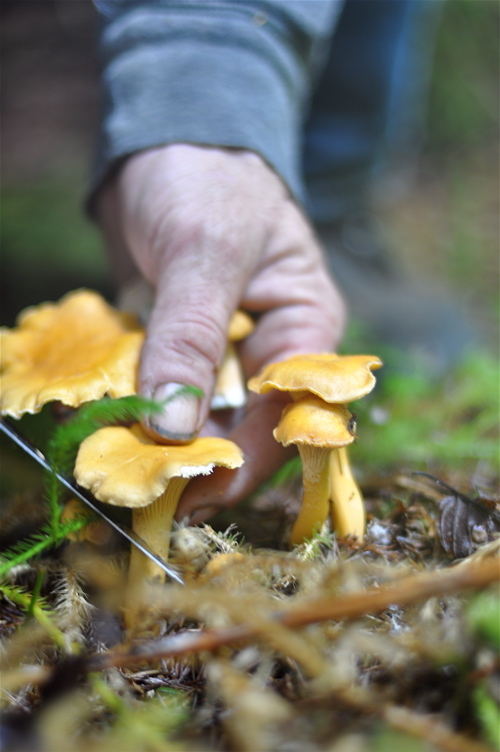 I got a bucketful at a go-to patch in the Cascade foothills last week, and this week I brought a class, along with Andrew MacMillen of the Kitsap Peninsula Mycological Society, to a patch that had just started cranking out both goldens and white chanterelles. Andrew scouted the patch last week and covered plenty of ground before locating this microclimate in a north-facing gully that was cool and wet enough to produce chanterelles while the rest of the area was bone-dry. This is what I love about mushroom hunting. It's a game of skill and you need to know how to play all the cards in your hand. In this case, the main cards were meteorology, topography, and tree composition. Tree composition is the easiest and best card to play with Northwest chanterelles: young second-growth Douglas fir. The meteorology card was a little more difficult: we knew we had to take our Bainbridge Island class due-west to the southern Kitsap Peninsula where there was more precipitation. The topography card: shady pockets within north-facing slopes. Using our knowledge gained from years of chanterelle hunting while wearing the prognosticator's hat led us to this one small ravine where two different species of chanterelle were flushing in profusion. What a treat to watch the students experience the thrill of the hunt. Shouts of "I've got one!" rang out through the woods, and everyone filled their baskets. Back at the kitchen facility we made Chanterelle Duxelles. The first chanterelles of the season are always my favorite. They're firm and flavorful, without the large, tattered caps that are typical later in the season after multiple rain soakings. I like to save my smallest chanties for meals like the one I made last night: Veal Shank with Saffron Cream & Chanterelles. The recipe came from an excellent new cookbook by Jennifer McLagan, Odd Bits: How To Cook the Rest of the Animal, just out this month. As you know by now, I'm a fan of nose-to-tail cookery, not just because it makes economic and conservation sense but also because the odd bits often taste best. Shank, though less adventuresome than organs, is one of those bits that's loaded with flavor—and in the case of veal, marrow. 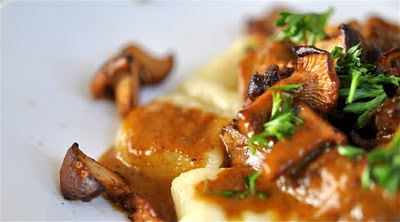 It's a rich cut, no doubt, which is why the chanterelles made such a perfect pairing, with their light fruitiness that lifted the dish from its heavy underpinnings of braised meat and cream sauce. The author recommends a whole shank for this dish; I was only able to purchase a pre-cut section of shank normally used for Osso Buco, but this turned out to be just right for two. Otherwise I used almost the same amounts with a few minor exceptions. 1. Pre-heat oven to 300 degrees. Pat dry shank and season with salt and pepper. In a large, heavy casserole or dutch oven, brown the shank in 1 tbsp olive oil and half the butter over medium-high heat. 2. Remove shank and add remaining 1 tbsp olive oil along with onion, carrot, and celery. Cook until softened over medium heat, about 10 minutes. Add the garlic, thyme, saffron, and tomato paste, stir, and cook for a couple minutes. 3. De-glaze with white wine. Add the stock (I used Demi-Glace Gold from a package). 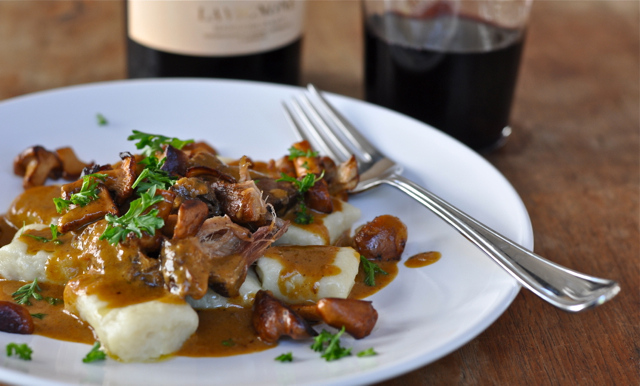 Return the veal shank to pan with any juices, cover, and cook in oven for 1 hour. Turn shank, cover, and cook for another hour. Uncover and cook for final 30 minutes or so, until meat is tender and almost falling off the bone. Add water to braising liquid if necessary at any point while it's cooking in the oven. When done, transfer shank to a plate and cover loosely with aluminum foil. 4. Strain braising liquid through a sieve, making sure to press vegetables to extract juice. Reduce liquid in a saucepan to 3/4 cup. Stir in cream and check seasoning. 5. Meanwhile, saute chanterelles in remaining butter over medium-high heat. I plated the veal shank over home-made gnocchi, scattered the chanterelles around the plate, and finished it with a generous pour of sauce and a sprinkling of chopped parsley. 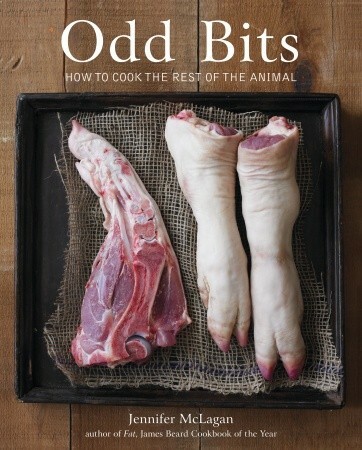 I just tried your recipe, although I didn't have any mushrooms available. It was delicious. I cut back on some of the time with very good results. For example, instead of the second full hour, I only cooked the pot for 30 minutes and then reduced the 30 minutes uncovered to 15 minutes. I only pushed half the sauce through the sieve, leaving small chunks of cooked veg for texture. The meat was tender, packed with flavor, and very satisfying. Thank you for a wonderful recipe.